Baptism is the basis of the whole Christian life, the gateway to life in the spirit and the door which gives access to the sacraments. Through Baptism we are freed from sin and reborn as children of God : we become members of Christ, are incorporated into the church and made sharers in her mission. Baptism is the sacrament of regeneration through water and the word. 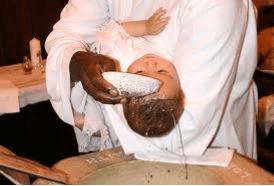 The sacrament of Baptism is a serious matter and needs careful thought and preparation. The rite itself is quite explicit about the role and responsibility of parents who wish to bring their child into the family of the church through Baptism. In asking to have your child baptised you are accepting the responsibility of training him/her in the practice of the faith. It will be your duty to bring up your child to keep God’s commandments, as Christ taught us, by loving God and our neighbour. • To have your child baptised in one of the above churches you must normally live within the boundaries of that parish. • One of the child’s parents must be a practising Roman Catholic. • You are requested to attend one of our Baptism Catechesis Programmes before the Baptism of your child – please see the next page for details. • The Parish Priest must be satisfied that the parents have a clear understanding of their responsibilities in having their child baptised into the Catholic Church. • The Godparents must be baptised Christians with at least one of them being a practising, confirmed Roman Catholic. Godparents must be firm believers, able and ready to help the newly baptised on the road to Christian life. Godparents are invited to join you in attending the Baptism course. Only two names of godparents are recorded in the Baptismal register. • Baptisms take place on Saturdays at 12 noon or Sunday 12pm or 3pm in the Holy Spirit church. • In the church of Our Lady of Grace Baptisms take place during 11am Sunday Mass or after Mass. • It is customary to make an offering on the occasion of Baptism. Before the Baptism of your child we ask that you attend a meeting to prepare for the sacrament. The meeting is informal & relaxed and is run by young parishioners who are parents themselves. Godparents are very welcome to attend the meeting with you if they wish. We hope you will enjoy the opportunity to explore the significance of Baptism and the chance to meet other parents whose children are to be baptised around the same time as your own. You can attend the meeting before or after the birth of your baby. If you come along after the birth you are very welcome to bring the baby with you but we ask that you do not bring other children along. The meeting will take place in the Parish Social Centre on Victoria Road, West Bridgford, next to the church of the Holy Spirit. The meeting will run from 8pm until 9.30pm on Wednesday evenings on the following dates. Please choose one meeting.